I wrote a book on Heroku! 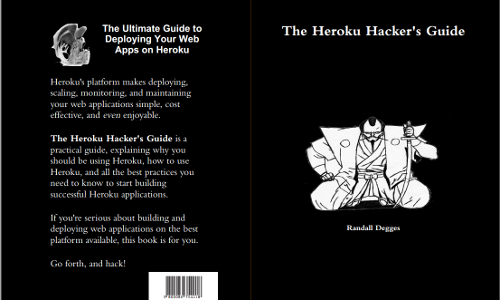 It’s called The Heroku Hacker’s Guide, and you can buy it (right now!) in both e-book (PDF) and paperback formats on the new book website: http://www.theherokuhackersguide.com/. If you’ve read my blog, you know I tend to talk a lot about web applications, infrastructure, and best practices. My real passion as a developer (and startup guy) has always been building things. I love creating new products, services, and APIs. I love working on open source code. And I really love deploying my code to simple platforms that encourage me to write good code, and allow me to grow my applications as I please. Since first using Heroku, I’ve been incredibly impressed over and over again by their product, service, and culture. Not only has it been incredibly simple and straightforward to deploy my web applications on Heroku’s platform– it has been enjoyable. Over my years working on and building web applications, I’ve done all sorts of devops work. I’ve built continuous integration and deployment systems. I’ve written puppet modules to bootstrap software services. I’ve spent time writing Rackspace and EC2 auto-provisioning scripts that boot new servers and kickstart software configurations. I’ve learned how to automatically load balance incoming HTTP requests. All in all, I’ve spent thousands of hours building fail-safe web services. But I can tell you now that the single most effective thing I ever did to free up my time and let me do what I love (build things) was to start using Heroku. In my opinion, Heroku has gotten things right. They’ve built a platform-as-a-service company that encourages best practices development, and gives you all the tools and transparency you need to deploy amazing software that people love. Outside their product, Heroku is filled with amazing people doing amazing things. They actively build and release open source software (look at their GitHub account), they hire amazing people that build amazing things, and they genuinely care about their users. My new book, The Heroku Hacker’s Guide, aims to be a practical guide to using and understanding Heroku’s platform, from the ground up. Regardless of what programming language or web frameworks you use, if you’re serious about deploying your web applications to the best platform around, and want to master your tool set, this book is for you. If you’d like to buy the book (or learn more about it), you can do so here: http://www.theherokuhackersguide.com/.